Black pepper is from the plant Piperaceae family and is widely used as spice and medicine. Pepper comes in both black and white forms where black pepper is one of the most widely used spices in the world. The dried grains derived from peppercorn, consumed in the form of granule or powder form in spicy foods and also as a medicine. The chemical called piperine present in black pepper causes the spiciness while consuming in food. Pepper also has antibacterial effect and also rich source of iron, manganese, potassium, dietary fiber etc. 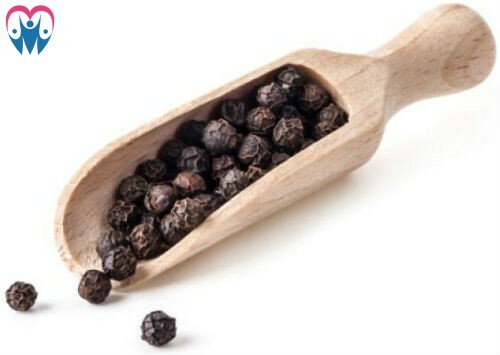 Black pepper is considering has the power to kill cells in the body and their by considering as a cancer curing agent. Pepper has long been recognized as an ingredient for stimulating the appetite as well as an aid in the relief of nausea. Human body produces hydrochloric that uses in our digestive functions. The food may stay in the stomach for long time when the body lacks hydrochloric and that may cause other side effects like heartburn and irritation. Black pepper can stimulate taste buds in your tongue that can send the trigger to your stomach to increase hydrochloric acid secretion and that will help to improve digestion. Manganese can activate the enzymes in your body that use to metabolize nutrients, proteins and fats from your intake food. Black pepper contains a fair amount of manganese around 370 micrograms per tables spoon of pepper. Black pepper provides immunity power to your body. Black pepper can ignite the release of nitric oxide that can signal the body to fight off pathogens. Pepper is great to use as a homemade dandruff remover. The anti-inflammatory properties in the pepper can get ride of dandruff from your hair. You have to use in granule or powder shaped pepper for the best result. Try to get a fresh grinded pepper for this rather than ready made powder. For best results mix one tablespoon of pepper with quarter cup of curd or 3 teaspoons of olive oil and massage on your scalp. Clean it after and hour and this will clean dandruff with in 1-2 days of treatment. Repeat the above for 3-4 nights to make sure that you completed get ride of dandruff. Limit the pepper amount to one tablespoon or it may cause to burn your scalp. Pepper contains piperine that can interfere with the fat cells generating genes to reduce the fat generation and also to enhance the absorption of essentials nutrients into your body. In addition to this, potent phytonutrients contains in the outer line of pepper that can stimulate the break down of fat cells. In short pepper can help body to absorb nutrients to the body and also to melt down unnecessary facts form the body. Black peer can act as an exfoliating agent on your body. It is widely used in body scrub bars because of the coarse pepper can act as exfoliating agents to remove dead cells, cleanse and improve blood circulation on skin. Black pepper also has the ability to help fight cellulite in your body. Black pepper powder mixed with pure honey is known best for respiratory congestion and also help to dry up mucus membranes. This spice herb can boost the blood circulation in your body, make you sweat and improve urine production in that help to get ride of toxins from your body. Black pepper can also be used to colic and diabetes problems and good to enhance food digestion. The ground pepper powder can mix with honey, olive oil or ghee to treat for the above symptoms. Do not eat too much of the spice, it can cause severe side effects. Use black pepper with caution if you suffer from acid reflux or a peptic ulcer. Important component in this herb is a phytochemical called piperine, which transits the characteristic spicy taste. Interestingly, when inhaled piperine present in this spice acts as an irritant in the nose and causes sneezing.